There were pieces of machinery from the factory left on the ground, too unimportant to sell off, too heavy to move, too bulky to bury, left scattered like clues from a lost civilization, droppings of our failure. Might as well been the bones of the men who worked there. I think God owes us an apology. 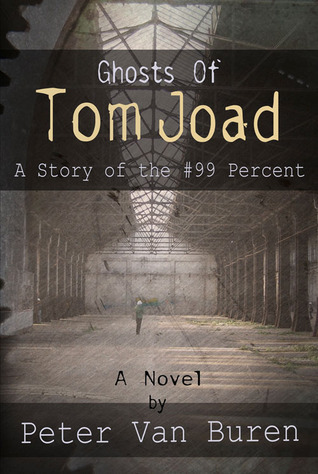 Ghosts of Tom Joad: A Story of the # 99 Percent by Peter Van Buren is a story of modern America’s Rust Belt. Van Buren is retired from the State Department. His career took him to Asia and Oceania. Van Buren also worked closely with the military including the Marines at Camp Lejeune. The title of the book caught my attention mainly from the Bruce Springsteen album of the same name. It seems the author was more influenced by Rage Against the Machine version. I had to look up the Rage version and in the process found Springsteen performing the song with Tom Morello. The story is about Earl, a man growing up in a small, fictional, Ohio town of Reeves that survives off the glass factory. Aside from the draft or volunteering for the military most people work at the factory. The economy is starting to turn in the late 1970s. Slowdowns, overseas competition, and new technology attacked the American dream. America felt invulnerable and did too little too late to compete. Manufacturing was sold to foreign investors or simply moved overseas. It wasn’t a sudden collapse. There were signs. No money to pay for college. Wives working outside the home to help make ends meet. It was a slow collapse that no one wanted to see. I grew up in Cleveland, Ohio around the time this story takes place. I could see some of this happening, and on my 18th birthday I signed up for the Marines. Industry was on the decline. There was no way I could afford college working as a cook at Howard Johnsons. Ghosts of Tom Joad brought back many memories of the city I left more than thirty years ago. Every so often I pick up a book to review that not only wakes me up with a slap to the face but also beats me down and makes me realize how one decision put me where I am today and not unemployed, working for minimum wage, and a step away from being homeless. I felt very much like I could have been Earl if I had stayed. The story is very realistic and typical of the environment. I highlighted and noted almost as many passages from this novel as I would from a nonfiction book on an unfamiliar subject. Some of the highlights are facts and others the author’s opinion in the words of a character. “We had a Dairy Queen, a Catholic school and four Protestant churches” and a bowling alley. This like many lines in the book sound exactly like the town I left. Things happen to cities when industry leaves. Drugs move in. Meth is mentioned in particular in this book, but two years I read that heroin was in my old hometown. This was a town where the marijuana was green when I went to school. In Reeves, drugs move in and are in demand. It is something to break the monotony and is cheaper than drinking. It comes to a point where the worker finally breaks down and says “Why not.” It is a sign of hopelessness. More than just foreign investors move in; foreign corporations move in. We become the cheap labor for European and Asian automobile manufacturers. They build factories the same way we did in the third world. Towns fight for these factories with infrastructure improvements and tax breaks. “Detroit looks like Dresden after WWII and Dresden looks like Detroit before WWII.” Now, a nation of immigrants looks at other immigrants as the enemy: They take our jobs. Americans are forced to work as day laborers for a few dollars an hour or beg to work at a minimum wage big box stores, part time and without benefits.